Talk on the two artistic research projects TransCoding and GAPPP at the Ringvorlesung of the University of Innsbruck on the overall topic of "Diversität der Medien – Medien der Diversität"
The first half of the programme consisted of the composition Steina for violin, live-generated video and live-generated electronics by Marko Ciciliani. Panel Discussion on the topic "Forum Aesthetics" and performance of an excerpt of Slices of Life. Further panel members are Dieter Mersch, philosopher and researcher, and Marc Bangert, performance researcher and neurologist. Workshop and concert at the festival "Eesti Muusika Päevad 2018"
Performance of They speak in layered... for violin, soundtrack and video, a composition that was inspired by the travelling artist Monique Besten's contribution to our question "What gets your creativity going?". Release of the monograph on TransCoding published at [transcript], Germany. Based on the artworks that emerged from the project, Barbara Lüneburg investigates authorship, authority, motivational factors, and aesthetics in participatory art created with the help of web 2.0 technology. 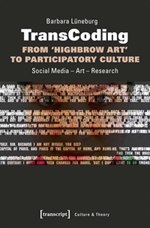 The interdisciplinary approach includes perspectives from sociology, cultural and media studies, and offers an exclusive view and analysis from the inside through the method of artistic research. In addition, the study documents selected community projects and the creation processes of the artworks Slices of Life and Read me. Topic of the conference: Over the past few decades, a rich body of literature has explored how individuals and groups use music as a resource to achieve social, cultural, and political participation and to bring about social change in society. Studies have also investigated music’s use by political groups and parties in the past and present to impose authoritarian, neoliberal, or even fascist political ideas. Finally, research in this area is concerned with the promise and myth of democratisation through technology with regard to music production, distribution, and reception/appropriation (quoted from the folder of IsaScience 2018). Slices of Life will be presented in the home town of community member Sabina Ulubeanu who contributed her beautiful photographs to the section Slices of Life – Charter of Rights and Freedoms. Slices fo Life will be presented in the home town of Louis Aguirre whose is featured in the section Slices of Life –I am a Priest"
Talk on TransCoding and Performance of Slices of Life. Performance of Soundwaves for violin and tape by Barbara Lüneburg, a composition realised within the framework of TransCoding. Barbara Lüneburg premieres Slices of Life in its full 30 minutes length and delivers a talk on the research project TransCoding. Video and audio documentation of Slices of Life for future release with the monograph on TransCoding. Barbara Lüneburg, presents her new composition "Slices of Life-The Shirt" as part of her solo recital at the Ultraschall Festival, Berlin. The composition is the initial sequence of her multimedia work for "Transcoding–From 'Highbrow Art' to Participatory Culture"
The multimedia composition "Slices of Life-The Shirt" developed in the framework of "TransCoding" is included in the show "Identity-Undoing Gender" of Barbara Lüneburg's students at the University of Music and Performing Arts. Barbara's student Katarina Michelitsch has developed the video material for the composition as part of the course work and in doing so has become a member of the what-if-community. Future collaboration on the project is planned. Mumuth, Graz, University of Music and Performing Arts, "Lange Nacht der Forschung"
The audiovisual installation "Read me" in the personalised versions of Clio Montrey (Poland/Austria), Gloria Guns (Canada), Ricardo Mateus (Colombia), Alina Murkhzahanova (Russia) and Maria Eppensteiner (Austria) will be exhibited at the "Austrian Night of Research" as part of the contributions of the University of Music and Performing Arts Graz. Barbara Lüneburg, delivers a lecture-recital on her research regarding collaborations between performers and festival promoters at the conference 'European New Music Festivals as Agorai' in Salzburg. Title of her lecture-recital: "The Artist-Promoter Relationship-Necessary Evil or Creative Potential?" As part of the management team of the artistic doctoral school (University of Music and Performing Arts Graz), Dr. Barbara Lüneburg participated in the symposium „Artistic Needs & Institutional Desires“ of the UdK in Berlin. From 13.-15.11.2015 topics of "artistic research" were investigated in round table discussions. Barbara Lüneburg talks on the research project "Transcoding | What if". Exhibition of the interactive audio-visual installation "Read me" in the personalized versions for Gloria Guns, Clio Montrey, Alina Murkhzahanova and Ricardo Tovar Mateus. As a keynote speaker Dr. Barbara Lüneburg talks about "Artistic Research in an Artist's Biography". Barbara Lüneburg exhibits the prototype of "Read me" and invites visitors and guests of the event to personalise the installation for themselves. Performance of What if we had wings? for violin, soundtrack and text based video. The first artwork realised in the framework of TransCoding featuring text contributions by community members.